What do we mean by breadth of opportunities? Society as a whole is responsible for the education of its members, and we acknowledge the importance of both the formal education system and the informal education opportunities for learning. The formal system houses certain mechanisms for providing education, particularly the more familiar structures like school. Other mechanisms naturally belong to communities, parents, and society at large and constitute the informal system. Together they constitute the learning ecosystem and fulfill society’s responsibility for education. We are interested in the learning ecosystem as characterized in Figure 1. The layered circles describe the degree to which a learner engages in formal and informal learning opportunities. At the center, “Formal Education” constitutes the least frequent but most structured activities and learning opportunities, whereas the largest circle, “Society at Large,” symbolizes the learners’ entire environment and includes the most frequent but least structured activities. 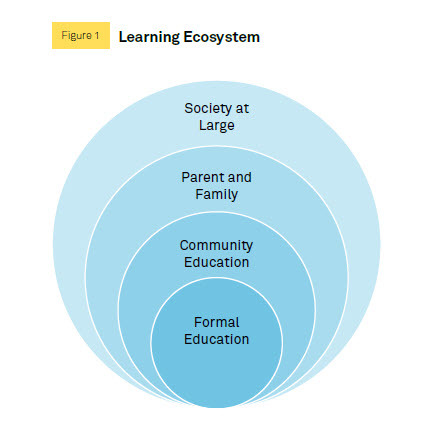 Thus the ecosystem’s two dimensions are: 1) opportunities for learning, which occur across the ecosystem, and 2) structure of learning opportunities, which vary from most formal in the smallest circle of the ecosystem to increasingly informal with the individual’s exposure to the wider community and society. Like all ecosystems, the four layers are permeable and interrelated, and internal and external factors impact each layer. Within the Skills for a Changing World project, our work focuses on formal education within the learning ecosystem, and will explore the context in which the formal education system adapts to a changing world. What do we mean by breadth of skills? Education of the 20th century was characterized mainly by content and knowledge accumulation. Skills development was dictated largely by the needs of the Industrial Age, which was in turn dominated by rote tasks and manual labor. Literacy and, to a lesser degree, numeracy were perceived as necessary in that they provided increased access to content and knowledge. In the 21st century both literacy and numeracy remain key skills. They are emphasized as the major goals of educational systems across the globe, and viewed as primary means to open doors for children to participate effectively in society. However, in what is referred to as the “Information Age” or “knowledge economy,” we need to apply a broader suite of skills for learning, work, and life. Skills are enablers—they provide us with the means to access a multiplicity of mental and physical activities. These skills rely not only on cognition, but also on the interdependencies of cognitive, social, and emotional characteristics. Shifts in skills, away from the narrow focus on literacy and numeracy and toward breadth of skills, are needed to navigate our changing societies (Brynjolfsson & McAfee, 2016) and for individuals to function as responsible citizens. Many governments are aware of this need for a broader range of skills and make this explicit in different ways and to varying degrees. For example, countries such as Australia or Singapore provide specific guidelines for the integration of both cognitive and social-emotional skills into schooling. Australia identifies several “general capabilities,” including literacy, numeracy, information and communication technology competence, critical and creative thinking, personal and social competence, ethical behavior, and intercultural understanding. These general capabilities are the key “set of knowledge, skills, behavior and dispositions that can be developed and applied across the curriculum to help students become successful learners, confident and creative individuals and active and informed citizens” (ACARA, 2016). The general capabilities are integrated within and across the content of key learning areas as appropriate. The Australian online curriculum provides links to show where the general capabilities have been incorporated in key learning area descriptions, and also provides examples and guides for their implementation into teaching and learning. Singapore’s approach calls for the integration of 21st century skills into both the academic and the non-academic curricula, and sees this as part of the country’s “holistic education.” Singapore notes that responsibility for development of these skills is placed with both the formal education system and parents and the two layers must work together, “hand in hand.” The Singaporean framework also notes that knowledge and skills must be underpinned by values. The skills referenced in Singapore’s approach include social-emotional competencies and “emerging” competencies such as communication, civic literacy, and critical thinking. 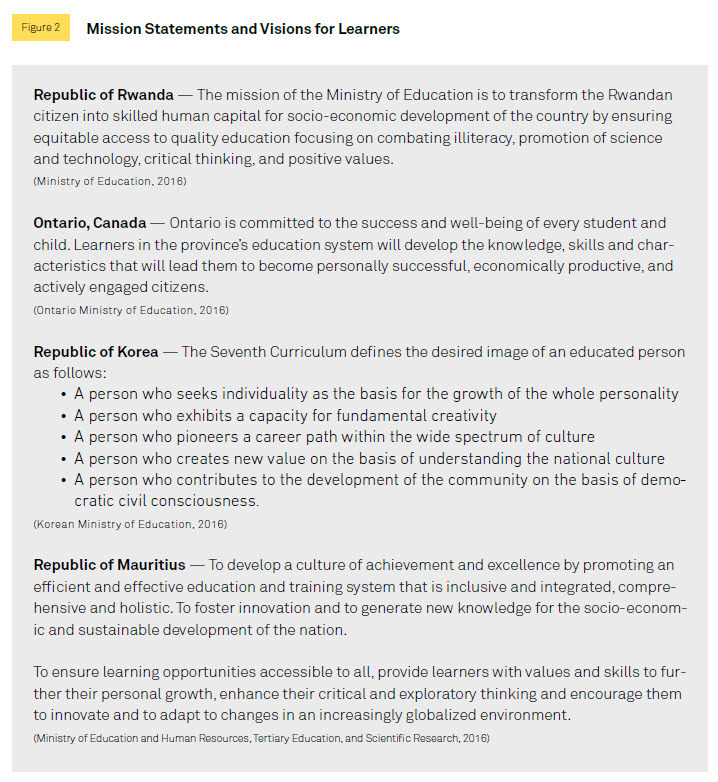 Many other countries express similar goals around breadth of skills, such as in Rwanda, Ontario Canada, South Korea, and Mauritius where the education ministries’ websites feature mission statements and visions for learners (see Figure 2). Although the skills identified in these mission statements are described differently, they share common ground. From high- to low-income countries, a trend toward broadening of curriculum is emerging, at least in terms of aspirational statements. The extent to which this breadth is reflected in the implementation of education systems is less clear. As far as global aspirations are concerned, the Sustainable Development Goal 4 (United Nations, 2015) names only literacy and numeracy skills specifically (target 4.1), although other skills are implied in various targets. These targets include readiness for primary education (target 4.2), technical and vocational skills (target 4.4), and skills needed to promote global citizenship and sustainable development (target 4.7). These targets signal an emphasis on the breadth of skills necessary to comprehensively prepare children, youth, and adults for 21st century citizenship and life. In the Skills for a Changing World project, we study the alignment of the worldwide aspiration for breadth of skills with its implementation. As with the execution of any vision, particularly large-scale transformations, the application of breadth to education systems varies greatly from country to country. We focus on the factors that fuel the uptake of breadth of skills as well as the elements that lay the foundation for breadth within the formal education ecosystem. How will focus on skills development influence the formal education system? The formal education system will need to undergo wholesale change to provide breadth of skills for its students and graduates. Since education was acknowledged as a human right nearly 70 years ago, educational endeavors have primarily focused on content and knowledge accumulation. Accordingly, teachers focused on content (primarily on its delivery); curricula focused on content (not on how to use it effectively); and assessment focused on content (particularly on its accumulation or lack thereof). Refocusing our activities from content accumulation to skills development sharply impacts each of these three components. This project focuses on the extent to which this interdependency is recognized and acted upon and the degree to which it facilitates the implementation of breadth of skills in curriculum, pedagogy, and assessment. All three will need to be reformed in the drive for breadth of skills. Curriculum is the education system’s roadmap. It has a starting point and an end point. It outlines both the objects along the way, such as subjects, topics, and activities, and the route (or routes) to take. It can describe different ways of using the objects and different ways to navigate the routes. When breadth of skills is valued in the curriculum, the roadmap focuses on how the objects along the way are used in the service of the end goals, whereas a curriculum valuing content knowledge simply notes their existence or emphasizes memorization of their origins and purpose. Consequently, within a skills development context, the curriculum needs to be explored and analyzed in a way that optimizes these objects as learning stepping stones rather than as discrete learning objectives. Teaching is not the mere provision of content knowledge from instructors to students. Teachers are the primary navigators and implementers of the curriculum, and as a broad range of skills becomes valued as “core business” for education systems, teachers will need to teach these skills and their application. Teaching for these skills may require a specific set of pedagogical strategies, with new methods and tactics adapted to the changing roadmap. Therefore, one of the consequences of including a breadth of skills in the curriculum is the need to reexamine pedagogical practices. Assessment is the way we evaluate learners’ progress toward the endpoints of the roadmap. In an education system focused on breadth of skills, the learning target is the students’ capacity to process and use information, not their ability to store and recall facts. Thus the assessment target also changes to evaluating that processing capacity, which poses a challenge for assessment experts. Assessing whether a student knows a fact is relatively simple for test development. Assessing whether a student can identify how that fact can be used is complex. We shift from a well-defined goal to an ill-defined goal (Care & Griffin, 2014; Fischer, Greiff, & Funke, 2012). In the context of classroom assessment, we move from a “closed” question—where a student can respond yes or no, correct or incorrect, true or false, or provide the fact itself—to an “open” question or prompt, where a student can demonstrate understanding and application within parameters that capture student proficiency in an efficient and standardized way.